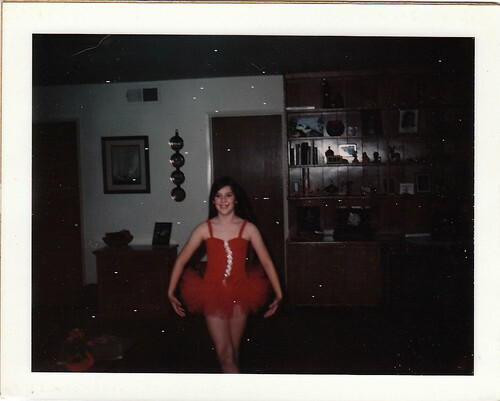 Prima ballerina was not to be my fate. As my sister says “There’s a reason my mom didn’t name me Grace.” We come from an almost absurdly clumsy family. Yes. Yes, I do. Trip and tip and crash and fall. My glasses are often askew from where I bump my head into things. While taking a shower, I bent over to put a bottle of shampoo on the shower floor. While bending, I experienced a sudden, violently strong sneeze, which came with such force that I lurched forward and slammed my head into the wall. This was on Sunday morning and made me say most unchurchlike things. I put 1/2 cup of oats and 1/4 cup of wheat bran in a measuring cup and let it sit on the counter while the water heated for breakfast oatmeal. Then I knocked an oven mitt off of a shelf and onto the end of the handle of the measuring cup, turning it into an instant oat catapult. Oats and wheat bran EVERYWHERE. It was like oatfetti. While bending forward to grab a bag out of my car, I simultaneously shut the door for no good reason. The sharp, pointy part of the door at the top corner met my cheek in such a fashion that I burst into tears for a brief, stormy moment. I went to shut the sliding glass door at my mom’s house. I was being careful to lock it as soon as I shut it, so I was shutting with one hand and reaching for the lock with the other. Instead, my index finger slipped into the open space just as I slammed the heavy door. Purple finger! My nail is going to be all black. It’s a good thing I don’t use my right index finger for anything ever /sarcasm. The last two incidents were on the same day, people. I am going to start wearing a helmet and a Michelin Man suit everywhere, just in case. I think it will be a good look on me. We could be sisters. I need a sister. I KNEW we were separated at birth. I’ll come to Christmas, but I won’t eat lutefisk! We could be sisters. I need a different sister. How do I apply? I’m glad to know it isn’t just me. Our “family” will have to have a well-padded home filled with Playskool-like furniture, except in adult sizes. Oh, I hear you. I gave myself a concussion last year. All I was doing was getting into my car and I got distracted by a noise behind me. I turned around and smacked the side of my head into the car. Took me nearly 3 weeks to get back to normal. I don’t see how football players do it. I don’t fall a lot, but I am always smacking myself into things. Wow. Now I’m really going to get a helmet. Oh, you make me laugh. Every single one of these things could have happened to me, too. Just this morning, I managed to bang the bejeezus out of my funny bone, and I was standing completely still at the time (I smacked it into a doorframe). Ten minutes later, I almost broke my pinkie toe when I stubbed it on the corner of an ottoman. And then within another five minutes, I hit my elbow on my closet doorframe when I went to get my shoes. All this, and I WAS a ballerina for umpteen years! So I guess I’m glad my parents only sent me to ballet for 2 years instead of 13. That’s just like my middle kid. She is continually falling, tipping things over and generally moving through the world like she’s auditioning for a 3 Stooges movie. Maybe you missed your calling in slapstick. I wonder what it is that makes some people graceful and others clumsy? Oatfetti: Loves it! I totally do that all the time. Along with the assortment of bruises S wonders where I picked them up ’cause he’s certainly not bashing me around. I bet Goldie wasn’t interested in licking up your oatfloorcreation either? Goldie was not interested. Maybe if it had been jerkyfetti. Monday night I was innocently opening my car door when WHAM something hit me HARD on the top of the head. Turns out it was a broom that had been hanging on the wall of the garage. I must have nudged it with my back when I bent over to put some stuff in the passenger seat of the car. I also said many unchurchlike things. You do at least make me feel like I have company. Last summer I dislocated my shoulder when I tripped and fell while carrying the mail. In November, I dislocated it AGAIN when I tripped and fell while carrying…NOTHING. I am currently at home recovering from shoulder surgery to make it stay where it belongs. i’m so like this too! i can’t walk thru a room without bashing myself into something. or (more likely) several somethings. personal best – in the last month? when i opened a heavy door to a store and brained myself. with the door. that i was opening. in the head. hard enough to make myself fall down. i keep expecting to see myself on youtube. That is the danger with modern life, isn’t it? I fully expect to see myself doing something stupid on YouTube before I pass from this world. Oh dear. I still take especial care when putting the garbage cans out on the street on Wednesday nights, remembering the time when I rushed up there Thursday morning and tripped over my goddamn Crocs and did a face-plant on the asphalt. OMG, I’m in pain just reading that! (In my mind, you look perfectly fine in a suit and helmet). I’m not a clumsy person. I just do embarrassing things all the time, like drop jars of pickles in Aisle 2 at the grocery store. So, see. My accidents don’t do damage physically. Just emotionally, in a therapy kind of way. It’s hard being me. I can dance like fiend, but I broke my ankle in four places while taking a step off of a curb. I feel your pain. I too am exceptionally clumsy. I have actually slammed my head in the car door. Once at the gym I said to the trainer “this is really helping my balance, I haven’t fallen down the stairs in a really long time”. He laughed and my bff said “she isn’t kidding”. I’m clumsy, too. I beat the crap out of myself all of the time…and then, when people ask what happened and I’m all “I ran into a door,” they start looking at my husband like he’s a monster. Except I really do run into doors, fall down stairs, drop things on my head, etc. etc. It’s nice to see I’m not the only one. It’s like an ABC After School Special – the girl who couldn’t stop hurting herself. Okay. You actually did make me feel better about myself. I’ve done some pretty clumsy things, but not quite so many as you. These are great little stories, though! You have no idea how comforting this is. I always feel like I’m the only person this kind of crap happens to. And I dread the day my husband and daughter come home to find that I’ve somehow tripped and broken my neck at the bottom of the stairs. Ugh. Really, though, this crap happens to me all the time. I KNOW. One day I tripped in the parking lot at work and hurt myself badly. I just lay there going “Ow ow ow” for the longest time, glad I get there early before anyone else is around. And it was exactly as annoying as when someone puts confetti in a greeting card. I KNEW you were my sista! Thanks for the laugh, and I’m sorry. Hitting your head on the wall in the shower just about sent me into hysterics. I’ve blown my lower back out sneezing in the shower, so this “hit” home, so to speak. Middle fingernail on my right hand is bent forever due to catching it in doors so many times. I’ve hit my head more than once while trying to close the trunk of the car. And it hurts so damn bad, I’m between laughter and tears. I’ve flipped dessert off of my plate more than once and it usually hits more than just the floor. Now you’re making ME feel better about myself. I enjoyed this to an unseemly degree.